This is the JRR edition of the popular SmallBar quickslot toolbar, updated, improved, and included in the JRR main theme. To allocate a function to a button, open the option panel -> UI settings (top of the page). Active button slots on toolbar are : left 1 to 7 (= all), right 1 to 4. (right buttons 5 to 8 are not displayed). within sub folders called _SmallBar default, _SmallBar alternate vitals and _SmallBar No extended panels. There is 1 skindefinition.xml per folder. 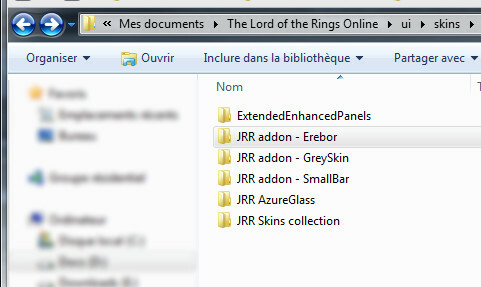 Copy the "JRR addon - SmallBar" folder in your "my documents" --> "The Lord of the Rings Online" (this is where your LOTRO screenshots are located) --> "ui" (not in capitals) --> "skins" (plural), create these sub-folder if they don't already exist. Log on the character onto you want to apply the _JRR SmallBar or the two others profiles. Select the theme from the panel menu --> UI Settings, as shown on the picture below. "_JRR SmallBar No-Ext" is a special profile dedicated to low resolutions screens. On this profile, no panel is extended. "_JRR SmallBar Alt.Vitals" displays alternate player/opponent vitals copied from B.G.M 5. The player vitals don't show its level. The player/opponent vitals can be placed closer to the bottom of the screen than standard vitals. To enjoy this SmallBar release, you first need to download and install JRR Skins collection, then the SmallBar file available for download on this page. But if you think "I just want to use SmallBar, I don't care the JRR other skins, I don't want to waste some space on my hard disk with all that crap..."
- Once JRR main pack and the SmallBar addon are installed on your computer, open the "JRR Skins collection" folder, it is located there : "...Documents/The Lord of the Rings Online/ui/skins/"
You can go even deeper in the customization way by deleting, in the "JRR addon - SmallBar" folder, the toolbar profiles folder(s) you don't want to display any more in the Lotro's skin choice menu ! - I just installed JRR and SmallBar and selected one of the skins on my character, some panels are displayed in a strange manner, like upside down. If only a few elements are grayed, this can be a error from my side (indicating a wrong location of a file in the skin). Don't hesitate to report me this kind of issues. If a big amount of gray frames occurs, first ensure you installed the JRR skins pack at the right location on your hard drive, then ensure you installed the "JRR addon - SmallBar" folder side by side with the "JRR Skins collection" folder. Advanced users can choose to revert it by deleting the whole "Ultra Mini-packs" section in the skindefintion.mxl file of every skin they wanna fix, and repeat this operation after every SmallBar update. Advanced users can revert it by deleting the "Map Window" section in the skindefintion.mxl file of the used skin(s) profile(s), and repeat this operation after every SmallBar update. The special profile SmallBar No-ext allow to play with resolution equal or lower than 768 pixels height, in both windowed or full screen modes. This profiles has all extended panels disabled. The special profile SmallBar No-ext allow to play with lowest resolution in both windowed or full screen modes, it has all extended panels disabled. These files are located in the SmallBar skins profiles folders. "Can I put the SmallBar's toolbar in JRR skins collection JappMe theme ?" Make a copy of your JappMe folder, beside the original one (in JRR skins collection installation folder), give it the name you want. Open it, delete the folder named "_JappMe - Large"
Open "toolbar" folder located in THE MAIN JappMe installation folder, delete all its content except the folder named "attunement" (and its own content). Now copy and paste the "toolbar" folder from smallbar folder in your new skin main folder. (say "ok" to fuse both new and existing "Toolbar" folders). 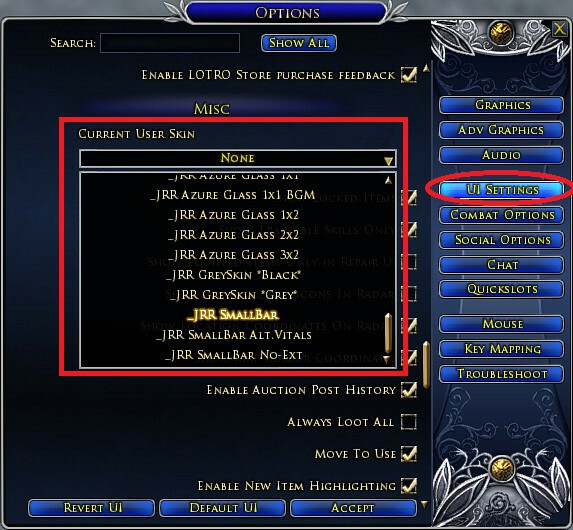 Copy-paste it from the beginning until "<!-- end of custom toolbar part -->"
Now change the name mentioned in the line <SkinName Name="
On the next launch of lotro, the skin newly created should appear in the list of your available skins. I built the JRR edition of this toolbar, based on the codes and elements provided in UiBuilder, released by The Old One. All other JRR credits are logged on the JRR Skins Collection homepage. - Small icons and xp bar are vertically re-aligned. - This update only consists into a customization of the 4 new bags greyed icons introduced in Update 13. - A bug introduced in v4.6 was blocking the display of the master loot panel and the need/greed/pass window, my apologies for this. - Quick patch for update 9 : Stable master panel fixed. - Since Rohan expansion has released, custom toolbars require to edit the height value to position the toolbar. This release no more include pre-made profiles. You will have to manually edit a line in the skindefinition.xml file (with Notepad or Wordpad or any else text editor) to fit your game resolution. More explanations about what to do are logged in the skindefinition.xml file. - Requires JRR v4.2 or above installed. 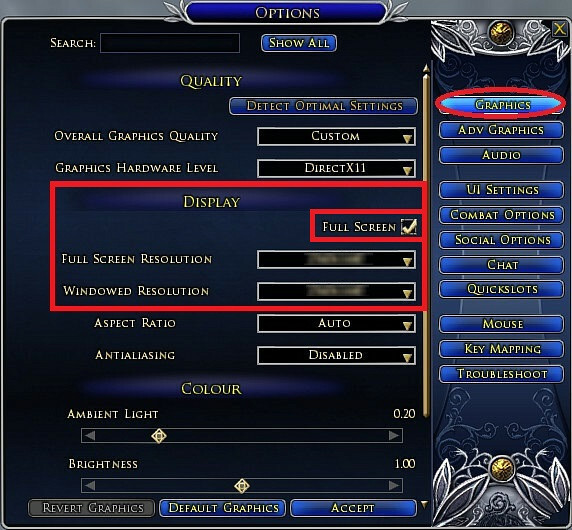 Or edit the skindefinition.xml file and in the line containing ID="ToolbarField" set the "Y" value equal to your lotro display resolution height minus the "height" value indicated on the same line. - Requires JRR v3.3 or above installed. - Requires JRR v3.2 or above installed. - Minimized the 6th bag button. - Re-designed the runekeeper's small attunement meter. - Fixes a good part of the crap introduced by the 5th anniversary update. 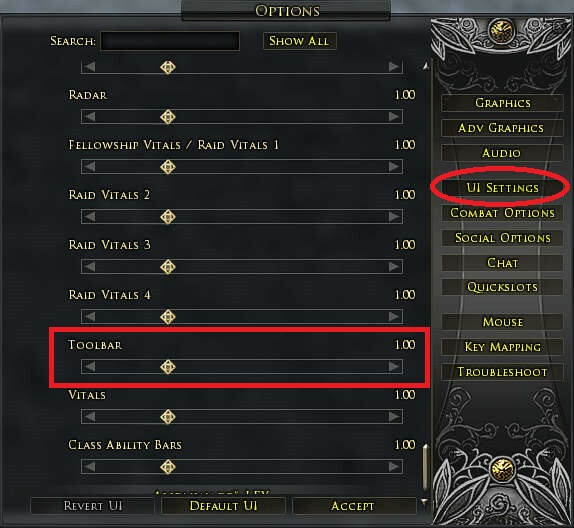 - Some fixes for the Lotro's 5th anniversary happy UI breaking. - Some toolbar adjustments (and I also reorganized its code). - A few other enhancements mainly around vitals. Requires JRR v2.0 or above installed. - Lotro store button now replace the bag 3 button, at the left of the start menu. - "Alt vitals" profile modified : No more level displayed on player vital, player and opponent vital pictures come from Brygard's B.G.M 5. - Requires JRR v1.8 installed. Activates all JRR v1.8 new features. On this one, the level is displayed at the top of the portrait. Theses vitals can be placed closer to the bottom of the screen than regular ones. Activates all JRR v1.7b new features. Fixed the Bio, Wallet and PVP mini buttons issue. Activates all JRR v1.6 new features, bug fixes and enhancements. Activates all JRR v1.5 new features. Activates all JRR v1.4b new features. Activates all JRR v1.3 new features. Just changed the pet vital bar's color to black. Added a new profile without extended panels ( designed for low resolution screens and more bug proof versus future client updates ). You have to edit its skindefinition.xml file before using it in order to center the bar ! - This update activates the new features introduced in JRR v1.1 (custom start menu & target of the target's icon). - Changed the default color to black. Added alternative color packs (blue and golden brown). - Rewrote a part of the code to adjust all the alignments ! - Changed the skin names to _JRR SmallBar****. - Deleted the 2 outdated parts of code concerning runekeeper's attunement, JRR default attunement is set instead. Well, I tried the new panels and they work just like I remember, and now I know how to make other UIs do it as well thanks so much for all the help as usual. Best author ever! Ugh.. I think you just called me ancient. I'll give this a try now! Thanks!! You're right, with U12.1 Turbine changed the code of the vital bars, and ancient codes were not compliant, so I didn't bother to re-calculate the potentially buggy shortened vitals, and just replaced it with the new vitals code of the JRR skins. Last edited by Adra : 07-09-2015 at 09:58 AM. But at one time one of the small bar options had a smaller default size to allow for placement of the vital bar lower on the screen (and yes, potentially missing out on some buffs/debuffs etc if you get stacked with them). One of them used to work and I thought it was no extended panels, but yeah.. if they are all as intended.. how hard would it be to modify one to support what I'm talking about? Hi, yes, the vital bars have the default size, intended to support the display of several lines of buffs and debuffs. Last edited by Adra : 07-07-2015 at 08:07 PM. Sorry, I meant the theme 'no extended panels'. Howdy! Thanks for keeping this up for so long! I'm recently back and was trying to use the SmallBar alternate vitals theme. I'm not seeing it change the size of the vitals box though, they are still the same big block size as the normal default. Unless of course I'm doing something wrong? When I try to move the target frames to the bottom of the screen they stop about too soon coz the 'target frame' is too big. Thanks again! Open the "toolbar" folder located in the main folder of the original jappme theme. copy the "attunement" folder and paste it at the same location in your new jamme theme. Last edited by Adra : 06-25-2015 at 08:25 AM. Hi, yes it is possible to include the SmallBar's toolbar into the JRR skins collection's JappMe theme. Last edited by Adra : 06-25-2015 at 08:56 AM.